Rolls Royce has just given an early Geneva Motor Show preview of their new concept series, the 102EX. To avoid any confusion, this is a Phantom Experimental Electric concept. One of the goals of 102EX is to gauge reaction amongst the public, Rolls Royce buyers, and share holders in regards to the concept&apos;s non-traditional drive train. 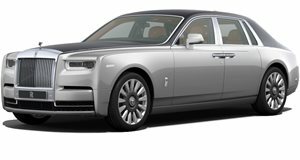 For now, the car is strictly a design study, but Rolls has high hopes reaction will be positive and people will accept an all-electric Rolls Royce. Based off the Phantom&apos;s aluminum spaceframe, engineers have installed two electric motors and a lithium-ion battery pack, which uses five lithium-cobalt-manganese-oxide "pouch cells." Charging is done by three individual 3 kW chargers that allow for both single-phase and three-phase charging at 20 hours and 8 hours , respectively. Induction charging is another method Rolls is trying out, which uses a giant transfer pad on the floor and an induction pad under the car. All told, the power setup produces 389 hp (the standard Phantom produces 453 hp). Current estimates for the 102EX give it a 124 mile range. It can reach 60 mph in under 8 seconds (5.7 seconds for the Phantom V12) and has a limited top speed of 99 mph. Of course, the 102EX retains many of the standard features that a Rolls Royce is expected to have. The exterior is finished in four coats of Atlantic Chrome, a paint shade that uses ceramic nano particles to give a unique reflective surface. It&apos;s also found in the interior on the gauges for battery charge level, power reserve, etc. The interior is decked out in Corinova leather that uses a "natural vegetable tanning process" and is 100 percent chrome-free, using aluminized foil weave instead of wood. The must-have Spirit of Ecstasy is made of Makrolon - not stainless steel - and will even glow.